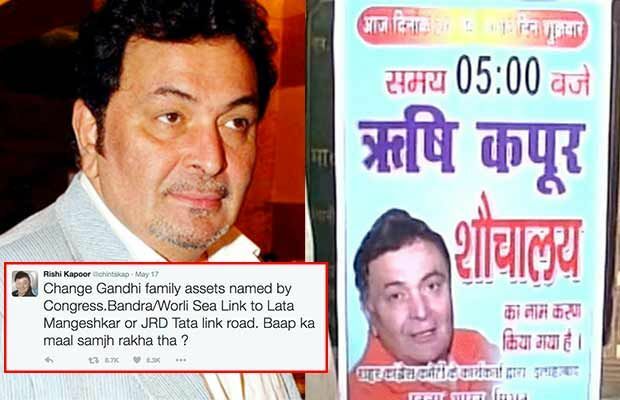 Recently, Bollywood veteran actor Rishi Kapoor had tweeted questioning on why all the properties are named after Gandhi’s. Rishi Kapoor had strongly lashed out at Gandhi family members especially Indira Gandhi and Rajiv Gandhi. Days after his tweets, Congress workers have made a comeback by hanging a placard over a Sulabh toilet with Rishi‘s name. Well, it seems Congress supporters made a point to respond Rishi Kapoor. On Monday, Congress workers gathered at the Shivaji Park area in Allahabad and hung a placard over a public toilet with Rishi Kapoor’s name written on it. Well, Kapoor has reacted to it saying that he is thrilled and that at least he will be of some use to someone as these people (Congress) are of no use to anyone. Kapoor always shows his honesty by the expressing his views on twitter but it seems this time he cab be in trouble for raising his point.